Despite the frequent rhetoric celebrating the generalist judge, do judges really believe in the generalist ideal? 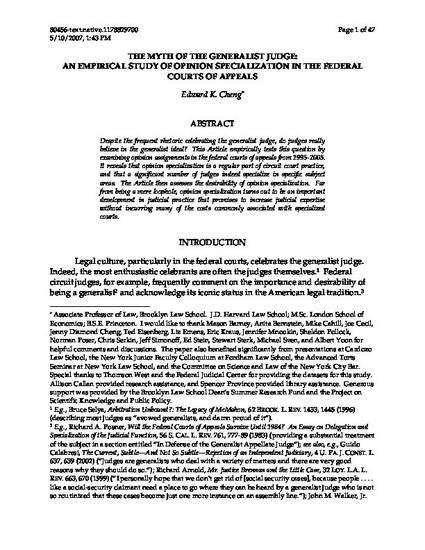 This Article empirically tests this question by examining opinion assignments in the federal courts of appeals from 1995-2005. It reveals that opinion specialization is a regular part of circuit court practice, and that a significant number of judges indeed specialize in specific subject areas. The Article then assesses the desirability of opinion specialization. Far from being a mere loophole, opinion specialization turns out to be an important development in judicial practice that promises to increase judicial expertise without incurring many of the costs commonly associated with specialized courts.